As the consecrated wife and spiritual companion of and a spiritual teacher and luminary in Her own right, Sri Sarada Devi, known worldwide as the Holy Mother, is a unique phenomenon in the realm of sacred beings. Perhaps the testament of Sri Ramakrishna Himself is the best recourse to take when attempting to describe Her. Once, when She was massaging His feet, She asked Him what He thought of Her. He explained to Her that the same Mother (Bhavatarini/Kali) that was in the Dakshineswar Temple and the same Mother that had given Him birth was now sitting before Him holding His feet. Though admittedly, this was an assessment coming from a being who saw the Divine Mother everywhere, more specific praise was forthcoming. In later years, when both of Them had discovered the full divine potential in each other, He was heard to say that the Goddesses Kali, Sarasvati and Lakshmi had manifested in the present age as Sri Sarada Devi. Victory to Sri Sarada, who is mother, friend, saint and teacher in one! Whose life was spent in efforts to remove ignorance from the minds of those precious spiritual children who took refuge in Her. Who shows concern for the world but remains ever absorbed in God realization. Holy Mother was born in 1853 in a village in India only a few miles from Sri Ramakrishna's birthplace. Far from coincidence, the two had a profound mission to accomplish and were destined to marry and become spiritual father and mother to thousands of aspiring beings. Though they lived a celibate life, the family that grew up around them is as diverse as the imagination can allow. From the highest ever-perfect soul such as Swami Vivekananda, to the humblest devotee and the most downtrodden unfortunate, including those laboring under evil propensities, the Great Master and Holy Mother received them all as children and tended to their many problems, needs, desires and aspirations according to their capacity and temperament. It is said that Sri Sarada Devi was the Master's first disciple. Though this is true in the historical and chronological sense, She being the first to come to Him after His sadhana (spiritual discipline) phase, the Master Himself said of Her, "She is my power. Without Her I could not even lift a finger." That the Holy Mother is so understated, historically, as well as among the devotees of Sri Ramakrishna and the western following of Swami Vivekananda, is due to several factors. First, She was only a small girl of five when She was married to Sri Ramakrishna, He being over twenty-three at the time. It was both practical and fortunate that She was given training by Him in worldly and spiritual matters when she later joined Him at the Dakshineswar Temple in Her late teens. Secondly, Her own subtle and humble nature demanded that She remain behind the scenes at all times, serving the growing spiritual family and working as the hidden power behind Sri Ramakrishna's work and mission. Thirdly, many eastern cultures have strict rules around modesty and decorum whereby women are hidden and protected as society dictates. These strictures were heavily in effect in mid-nineteenth century Calcutta, the scene of Their Mahalila (Divine Play), during Holy Mother's lifetime. By the Master's own admission, powerful aspects of the Divine Mother of the Universe were manifest in Holy Mother. Besides Her important part in His work of raising the suffering, tending to the devotees and serving the Master Himself, She would eventually take over His mission and oversee its crucial growth and evolution when He was no longer able. After Sri Ramakrishna's mahasamadhi in 1886, Holy Mother, then just 33 years old, became the lineage holder of the Ramakrishna Order. 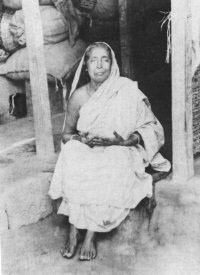 During the initial years after His passing She returned to Sri Ramakrishna's ancestral village and lived a simple and austere life interspersed by several pilgrimages. Once, while visiting Bodh Gaya, the sight of how the monks there lived in comfort compared to the impoverished conditions of Her own monastic sons, caused Her to pray intensely to the Master for a place where His disciples could live and worship accordingly. Later, when land for a monastery had been secured, due in part to Swami Vivekananda's inspiring work in India and abroad, the Holy Mother received the many devotees and visitors that came due to Sri Ramakrishna's growing fame. The monastic and householder devotees of the Master alike acknowledged Her as the Mother of the Ramakrishna Order and She assumed and dispatched all duties allotted Her with concern and efficiency. One of the more important of these duties involved initiating the growing number of seekers who were attracted to Sri Ramakrishna and the direct disciples. How fortunate were those who received direct mantra diksha (transmission of the mantra during initiation) from the Divine Mother of the Universe Herself through the open and pure channel of Sri Sarada Devi! Hundreds of these souls were granted admission into spiritual life and instruction in sadhana by Holy Mother. As part of Sri Ramakrishna's mission, as well as Swami Vivekananda's work in India and throughout the world, the upliftment of the suffering masses was of paramount importance. In line with this task, the development and emancipation of women played an essential part, for the Master and His foremost disciple knew that no regeneration of society would be possible if this was not accomplished. The Divine Mother of the Universe simply would not manifest in the collective heart of humanity if the divine Shakti power (Dynamic Mother Reality) lying dormant in all beings was not propitiated and revered. In this respect, the Holy Mother represents the ideal of contemporary womanhood, the perfect example of fully awakened, fully illumined Shakti power. As Sri Ramakrishna and Swami Vivekananda removed the veils of weakness and ignorance covering the minds of human beings everywhere, the Holy Mother opened the floodgates for divine feminine expression showing a way to liberation and acting as an example for women the world over to follow. In Her is seen the exquisitely balanced blend of power and modesty, strength and humility, detachment and compassion, purity and practicality. By accepting Her as the ultimate standard for the women of contemporary times, immaculate Shakti power will emerge and homes, families, schools, workplaces and spiritual centers will again become pure and divinized. O Sarada, propitious Goddess, killer of misery in souls resigned, Savior of religion in every age, By saints and sages worshiped, O Mother, kind, Give us love and wisdom, Thou, O Grace incarnate, to Thee we bow.